As you read this, you’re probably sitting down. In fact, you’ve probably been sitting down for most of the day. Although you’re far from being the only one, it’s important that you try to incorporate more activity into your daily life or your health will suffer. Easier said that done when you’re so used to inactivity! Here’s how to get started. Although you probably already know that you need to move more, you might not be completely clear on the risks of not moving. And, make no mistake, the risks are big. Humans were designed to be active, we were not designed to sit in a chair for the whole day before retiring to our beds. And, even if you do fit in an hour of exercise, it doesn’t undo the negative effects of sitting down too much. Research shows that inactive people are more likely to develop conditions such as heart disease, cancer and diabetes. You’re also more likely to be overweight, and to suffer from mental health problems. You also need to get rid of the idea that you don’t have the time to move more – you do, you just need to incorporate it into your daily life. For example, when socializing with friends you could all agree to meet up for a walk around the local park, rather than sitting in a coffee shop. Or you could move around while you watch your favorite TV show instead of sitting on the couch! Although you might think this won’t work with your life, you’ll be surprised at how many opportunities there are to get active once you shift your mindset and look at things differently. Next, understand that there are many ways to move beyond exercise. For example, many people are starting to stand up while they work at the computer, by putting together a standing-height desk, or by placing their laptop on a higher surface. Running around with your kids or dancing to your favorite music are also great ways to get moving. A thorough house-cleaning session even counts as great activity! At the very least, simply try getting up and stretching once an hour if you usually sit down. Lastly, realize that old habits take time to change. 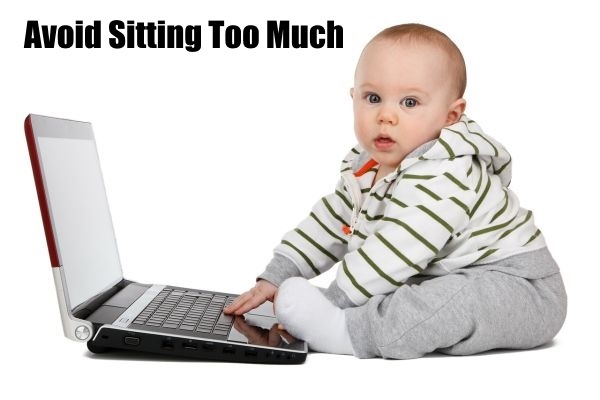 If you’re used to sitting down for all but an hour every day, then it’s going to be hard to change. Not only will you find it tiring being on your feet more, but you’ll also find that it can be hard to motivate yourself. This is completely normal, which is why you should try to make changes gradually until they become part of your daily routine.